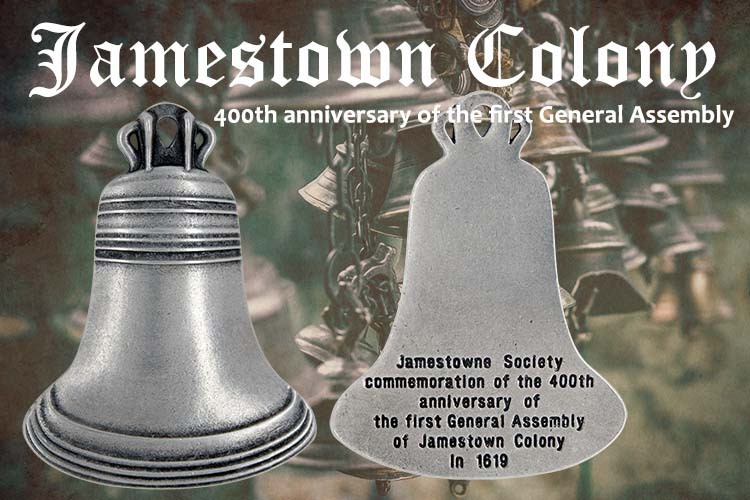 The Jamestowne Society is marking the 400th anniversary of the first General Anniversary at the historic Jamestown Settlement with this custom pewter ornament! This ornament is sure to be a collector's item for many years to come, and features a unique description on the back. The Society came to us after they uncovered pieces of the original House of Burgess bell. They were able to uncover enough pieces to create a replica of the bell. Once we had the image in hand we were able to create this custom ornament for them. Does your group or organization have an upcoming celebration or a need to raise funds? We would love to talk with you about how we can help with creating a custom and commemorative Christmas ornament, key chain, or coin for you. Congratulations to Jamestown, we enjoyed working with you. 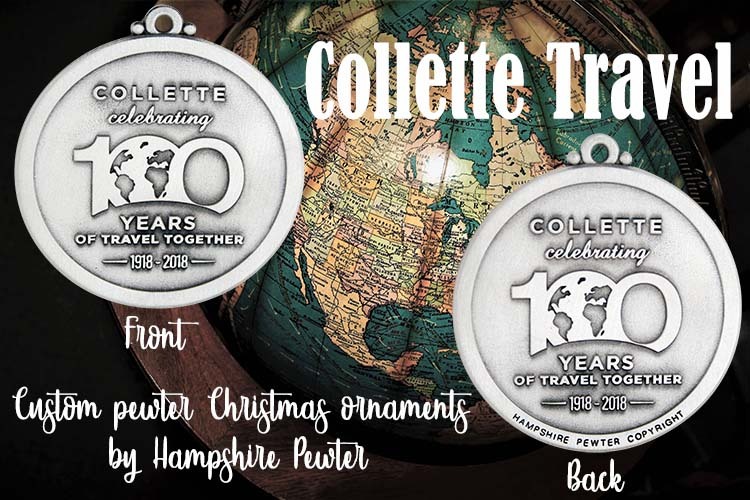 Hampshire Pewter was commissioned to create a simply elegant pewter ornament for Collette travel group and their 100 Years of Travel Together. The front and back of this Christmas ornament features their 100th anniversary logo along with their years of operation, 1918-2018. We were happy to work with them on bringing their logo and ideas to life! 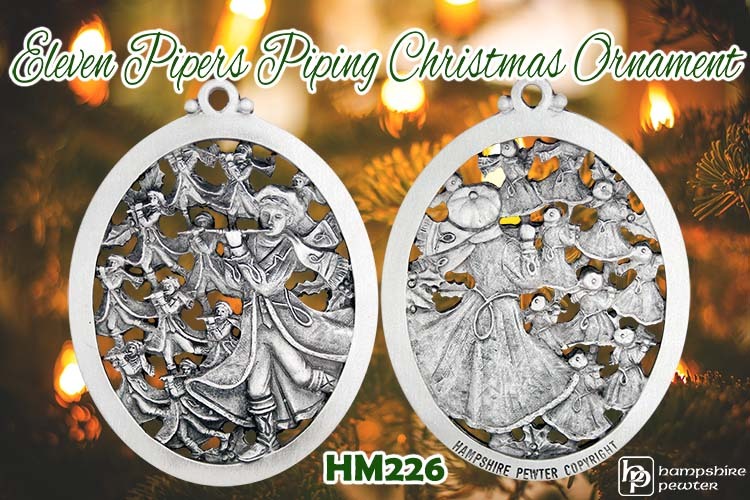 The Eleven Pipers Piping Christmas Ornament is the newest ornament to hit our shelves! It is also the most recent addition to our 12 Days of Christmas ornament series. This finely detailed ornament depicts an image of eleven men piping a tune, dressed in their coats, scarves, and hats. This scene comes straight out of the yuletide carol that we are all familiar with, and will look absolutely stunning on your Christmas tree! 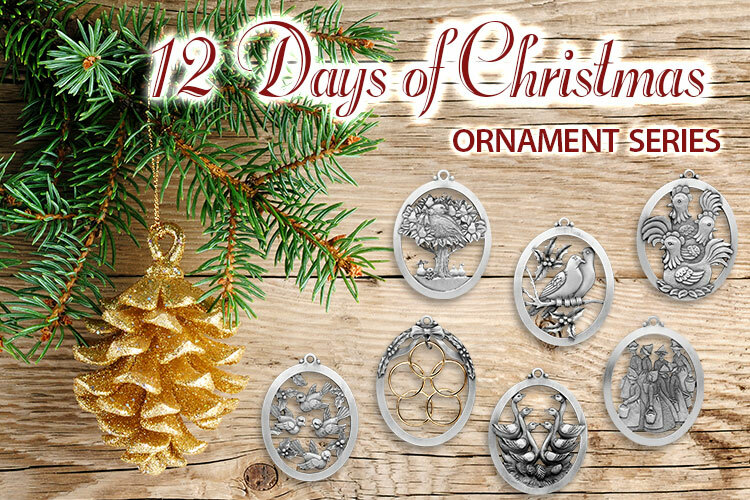 Hampshire Pewter has been creating the 12 days of Christmas ornaments for 11 years now. 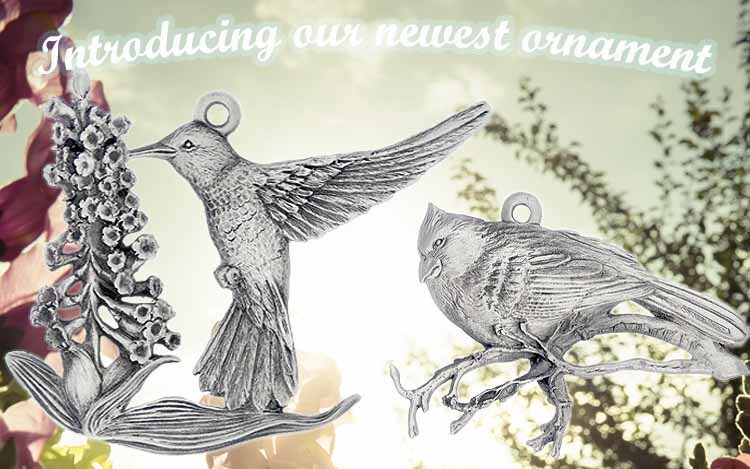 We have created a new pewter ornament for each day of the song, releasing one per year. Next year, Christmas 2019, will be the final release of the series. On to a new series, any ideas are welcome. Celebrate the school year with a custom ornament! 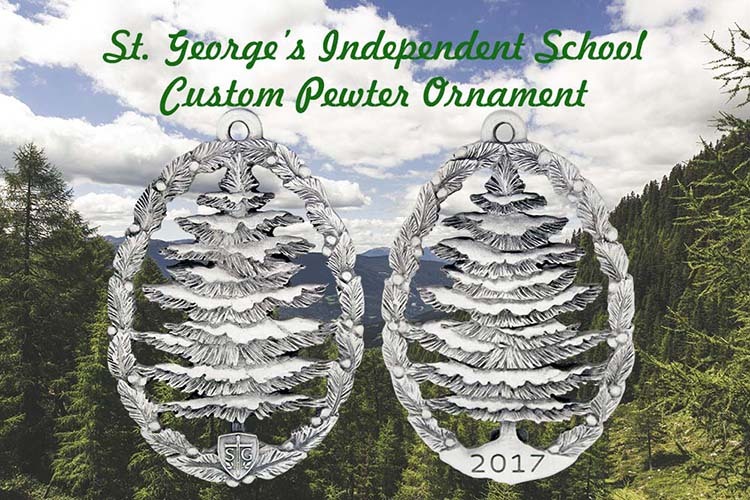 St. George's Independent School in Tennessee commissioned Hampshire Pewter in 2017 to create a fir tree that features their shield emblem and the year of commission. 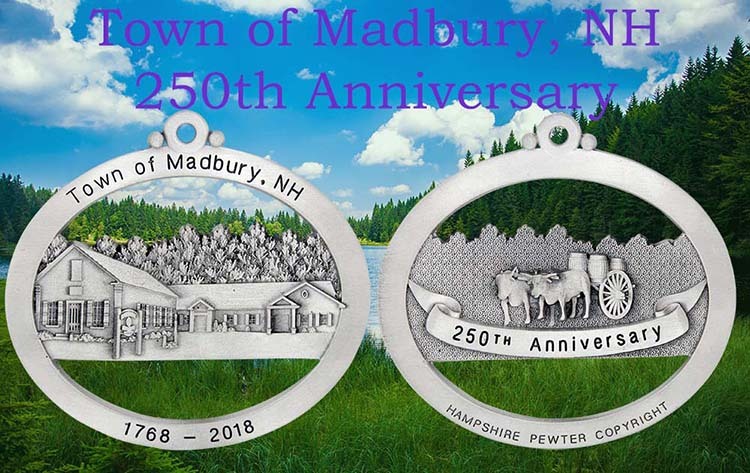 The Town of Madbury 250th Anniversary commemorative ornament features the town offices building on the front, and a pair of oxen pulling a cart on the back. 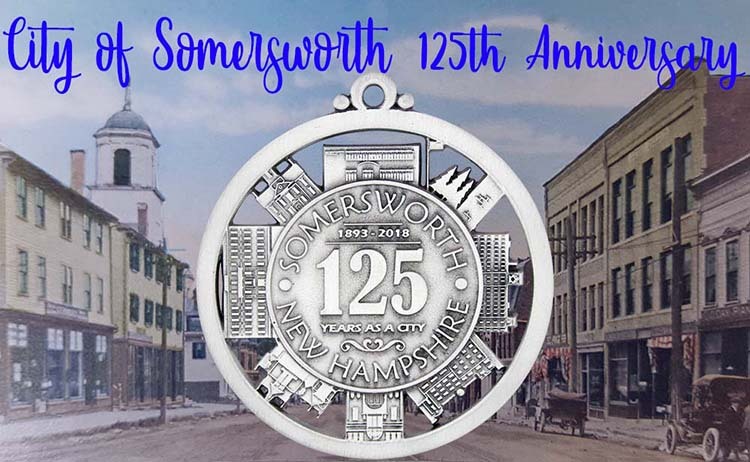 Hampshire Pewter is thrilled and honored to craft the custom pewter Christmas ornament for the City of Somersworth's 125th anniversary. This detailed ornament depicts several of the important buildings in the city and was designed by middle school student Ryan Drouin. Laser engraved wood ornaments make great holiday gifts! New this year is our LaserCreations USA line of wood ornaments available in natural birch and natural cedar! Started as a brainchild of our owners and employees, these unique and elegant wood ornaments will be sure to compliment your Christmas tree and add that extra special touch of personality! The finely detailed ornament showcases the hummingbird stopping to take a drink of nectar. 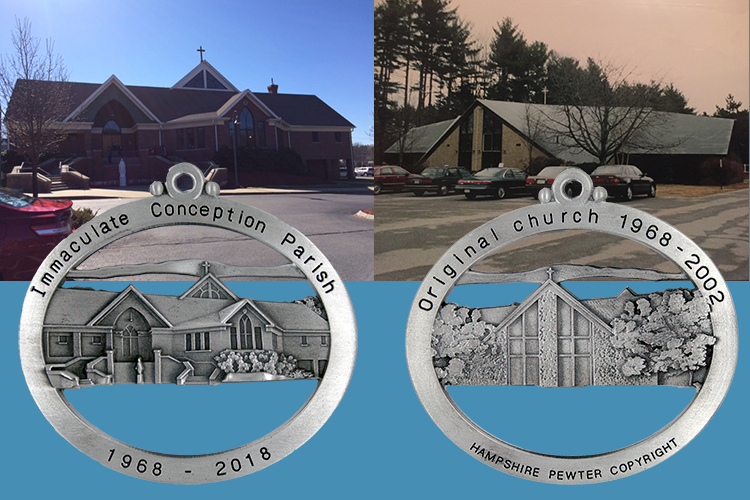 Hampshire Pewter was commissioned to create a commemorative pewter ornament as part of the celebration of Immaculate Conception Parish's 50th year anniversary. Every Christmas season at Hampshire Pewter we are warmed by the stories of traditions as shared by our customers. We have such a wide range of pewter Christmas ornaments to choose from, everyone finds that certain perfect symbol for their tree, as if it were made especially for them. From the tip of Cape Cod, Massachusetts to the rocky coast of Portland, Maine, lighthouses are a symbol of New England's rich maritime history. 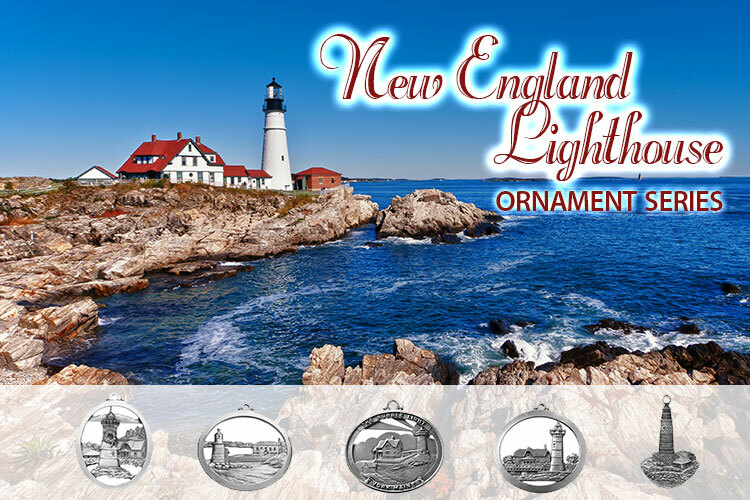 The Hampshire Pewter Lighthouse Collection captures the historic landmarks along New England's coast in a collectible pewter ornament series. New Hampshire is graced with 54 covered bridges--historic architectural gems dating back to the late 1800's. Hampshire Pewter has captured the beauty and wonder of these structures in our Covered Bridge Ornament Series.